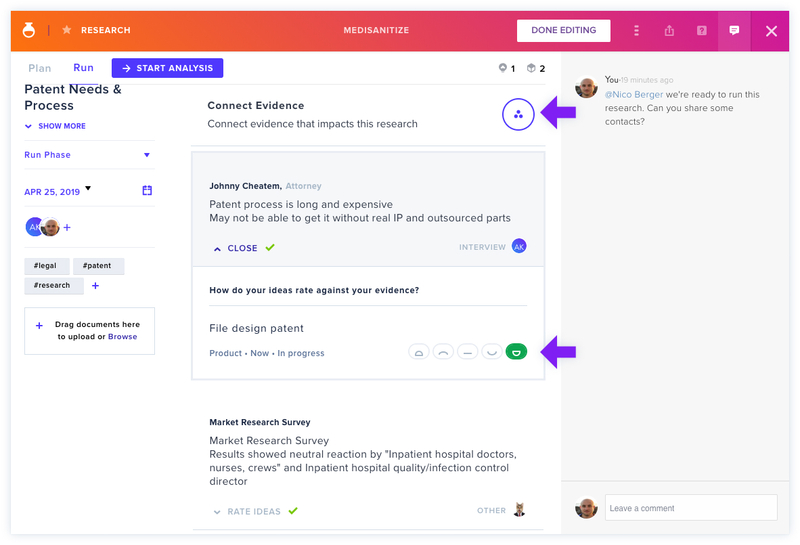 The Run phase allows you to connect or create Evidence corresponding to Research. To make the most of this section, you should get out of the building and find out what customers really want to help you learn more about your Research Objective. As you start to collect data, click Connect Evidence to add Evidence. Select all relevant Evidence (or click New to create and publish new Evidence), and click X to close. If you chose to connect Ideas, rate this Evidence against how confirming or disconfirming it was of your Idea. In this step, you're figuring out how much this Evidence does or doesn't support your Idea based on its content. When you're done, click Start Analysis at the top to proceed to the last phase, Analyze. Click here to go back to Discovery Overview.